Until recently, I was a loyal FreeRTOS fan – it’s a simple, lightweight task scheduler without any baggage. Anything extra can get integrated from scratch, or from third-party libraries. However, Reclone will need an RTOS with filesystem, networking, USB host, graphics library, real-time clock, and other bells and whistles, in a more permissive open-source license. Imagine my thrill when I discovered NuttX, which meets practically all of those needs, without a monumental integration effort. I wanted to get started with NuttX quickly, so that we will have something concrete to demo as our product is developed. However, I quickly realized that the tutorials for building NuttX are scattered, incomplete, and largely out of date (like this one). I wasted many hours of time going down the wrong path, before finally assembling a relatively simple set of instructions that would allow someone to build NuttX on a fresh Ubuntu install. Hopefully these instructions will save others some time and frustration. Build NuttX for a plain STM32F4-Discovery board, using a fresh install of Ubuntu Server 17.04 (32-bit x86). Then, flash the board, and connect to the NuttShell using a USB-to-UART adapter. I’m using a VirtualBox VM on a Windows 10 host for demonstration purposes. 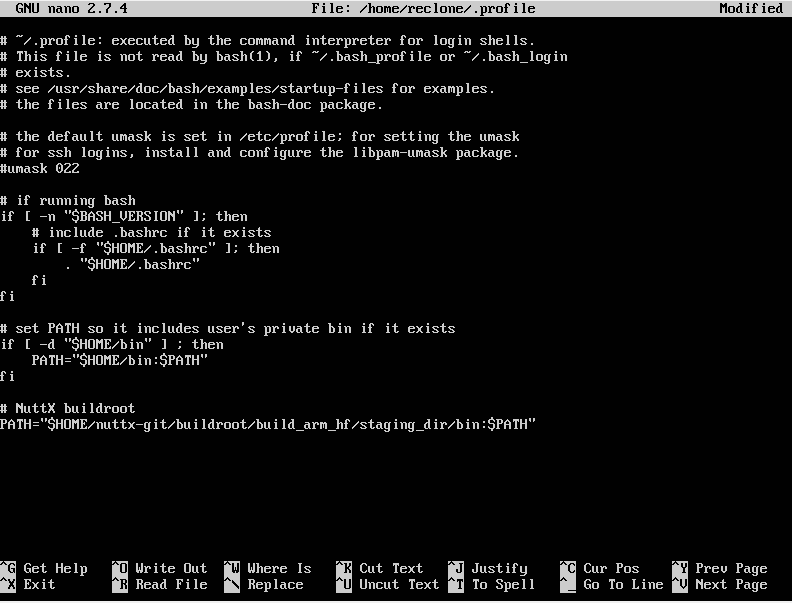 These instructions will probably work on other up-to-date Ubuntu and Debian Linux machines, as well. Once the GCC version is set, press Esc until you are asked to save the new configuration. Select “yes” and hit Enter. 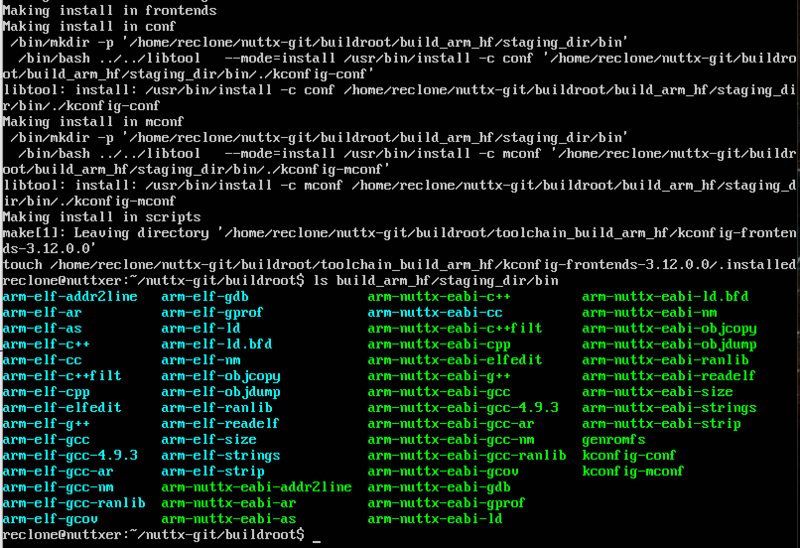 Make the NuttX buildroot. This will download source code and build the specific versions of ARM GCC compiler (arm-nuttx-eabi-gcc) and kernel menu config tool (kconfig-mconf) that should work well with this version of NuttX. This will take a while. Take a shower, drink a cup of coffee, Netflix and chill. When finished editing, hit Ctrl-X, Y, Enter to save changes and exit. Log out and back in so that the path changes in .profile take effect. Under Build Setup -> Build Host Platform, select “Linux”. Then, return to the main menu. Under System Type, enable FPU support, and select the Buildroot toolchain. 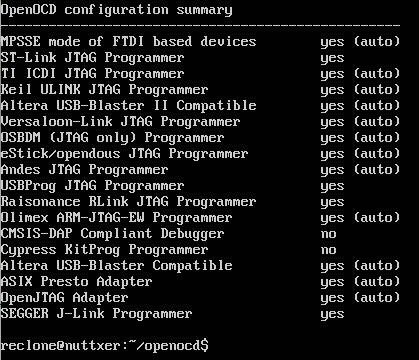 Exit the configuration tool, saving changes. This will actually build the NuttX source code, according to the configuration selected earlier. It should only take a few minutes. 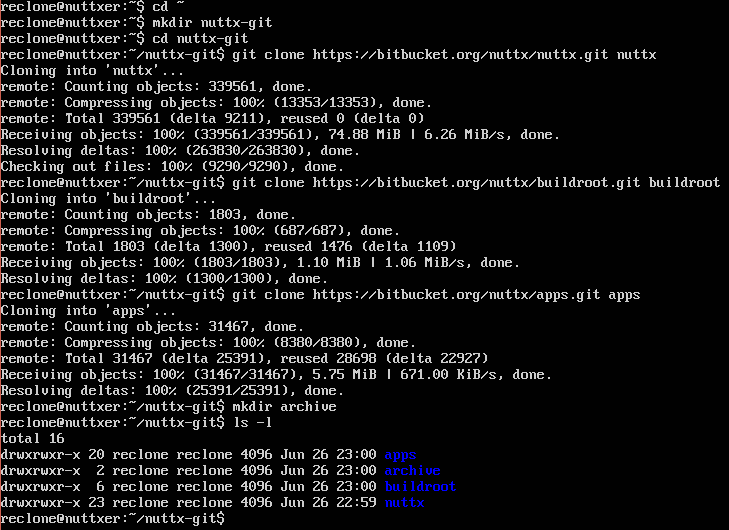 When it’s complete, you’ll be back at a prompt, and you’ll see “LD: nuttx” near the bottom of the build output. Success! Flash the nuttx ELF binary onto your STM32F4-Discovery board. First, connect the mini-USB ST-Link/v2 port on the Discovery board to a USB port on your Ubuntu machine. sudo openocd -f interface/stlink-v2.cfg -c "set WORKAREASIZE 0x2000" -f target/stm32f4x.cfg -c "program nuttx verify reset exit"
If you see “** Verified OK **”, then the firmware was successfully programmed! Wire up the serial connection to NuttShell (NSH). First, connect a USB-to-UART adapter to USART2 on the STM32F4-Discovery board. (I’m using the Pine64 PADI Serial Console, which currently sells for US$1.99 plus shipping). Do NOT connect power (+3.3V, +5V, etc.) between the adapter and the Discovery board, as the Discovery is already USB bus powered, and connecting the power pins together could damage one or both devices. Test the serial connection to NuttShell (NSH). These instructions should be everything you need to establish a toolchain, build NuttX, flash the STM32F4-Discovery, and connect to NuttShell on a modern Ubuntu system. We haven’t gone much further than to verify that programming was successful and that we can access NSH, but hopefully this can serve as a concise, known-working reference point for others hoping to accomplish similar goals. Reclone Labs doesn’t use Linux for everything. In future posts, we may present similar instructions on building NuttX in Cygwin, native Windows, or Mac OS. Let us know your requests, comments, questions, or feedback!